finish our surf lessons are particularly popular with hen and stag parties. What better way to start your day than with a splash in the ocean. After you have caught that first wave you will be buzzing all night long. Arrive at surf school, get fitted for wetsuits, booties and gloves (depending on time of year). Head down onto the beach for warm ups and some basic board skills instruction. Time to hit the waves, your instructor will be in the water with you giving continued instruction and encouragement. Our surf building has changing areas and a cafe where you can grab a drink or snack after your lesson. Alternatively why not give us a call and we can organise a barbecue to finish off your beach party. All equipment will be provided so all you need to bring is a towel and swimwear. Sick of paintballing and go-karting?? 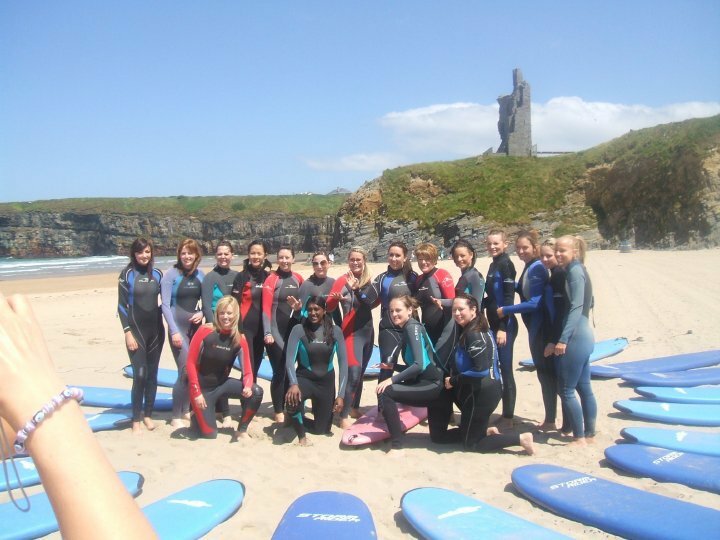 Why not reward your staff and yourself with a days surfing in Ballybunion! Available mornings, afternoons and evenings in two hour slots. Surfing is a brilliant way to bring people together, we have team building games in the water and can also organise lunch, dinner or sandwiches after the lesson. Call or email for our attractive corporate rates.